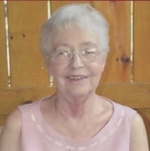 Kay Stentz, age 80 of Ashland, OH., passed away early Sunday morning, February 3, 2013 at Hospice House. On July 31, 1932 a baby girl was born to Lawrence and Geneva (Fendrick) Kennedy in Toledo. She was named Kay and was welcomed royally. When Kay was four years old her beloved Daddy passed away. Kay, her mother, and baby brother moved to Ashland to be closer to her grandparents, Bessie and Royal Fendrick. Kay graduated from Ashland High School in 1950. While in high school, Kay worked at Ashland College and The Home Company. Kay married Lee Stentz on August 17, 1950 and together they raised four wonderful children: Cynthia Gentle, Dianne (Mike) Stoner, Lel (Dan) Harlan, and Philip (Carol) Stentz, all whom are surviving. Also surviving are a brother, Larry (Pat) Kennedy; blessed granddaughters and grandsons: Amber (Alan) Mabry, Emily (Mike) Kubiak, Jen (Josh) Pollard, Nicole Stentz; Andy (Megan) Gentle, Ryan (Holli) Gentle, Patrick (Heather) Gentle, and Michael Stentz; two sisters-in-law: Jan (Russ) Forbes and Mary Stearns; two brothers-in-law: Bill (Mary Lou) Stentz and Jim Shilling; and numerous nieces and nephews. Kay was gifted with ten great-grandchildren: Aubrey and Hope Kubiak, Eden Pollard, Sean, Keira and Conner Gentle, Batavia, Matthew, and Joshua Gentle, and Carson Gentle. Kay also worked at Ashland Florist, Buff’s Lawn and Garden, and Samaritan Hospital for 40 plus years as a Red Cross Volunteer. But her most rewarding job was her grandchildren and great-grandchildren. We all lost a grand lady with Kay’s death, but are so very lucky to have had her in our lives as long as we did. Kay was preceded in death by her husband, Lee Stentz on July 11, 2004. Also by her parents, grandparents, two sons-in-law: Philip Evert and Daryl Gentle; and a grandson, Justin Gentle.